Be flipped, swung and soaked to the skin on Ripsaw… can you cut it? 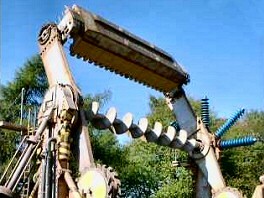 Ripsaw was another ride that was installed when Forbidden Valley received its major theming in 1997. The removal of the much-loved roller coaster Thunder Looper created a space which was filled with The Blade and the new ride, Ripsaw. It is a jazzed up Top Spin ride, with the added element of water jets that are guaranteed to get you wet. The ride is themed as a piece of shrapnel projected out the hole which Nemesis dug trying to free itself, when it was discovered. After taking few minutes to find the hidden entrance to the queue you should be greeted with a fairly small wait before you are strapped in by rather restrictive and tight over the shoulder and lap bar restraints. The ride varies from hour to hour, depending on the queue length and generally what the ride operator in control is like. Once the ride is off you will probably be greeted with a inversion held in place then a few with the two gondola arms pausing to fling the gondola over a few times, then the ride operator will tease you with water before lowering you down face first. This ride, if you're not going to ride it, is a very good spectator ride and nearly always gathers a crowd as you hear laughter and groans as the water jets leap up into people faces. This ride really does vary a lot, you could get the standard program which most people know like the back of their hand or you could be treated to a different program, one warning, only go on the last ride of the day if you want to go on the most extreme (and I mean extreme) program and not be dry all the way home!